Seems like this proud american Bald Eagle is waiting till the snow storm near Homer in Alaska is over. it seems like that Bald Eagles donÂ´t like stormy days at all, we have seen on several storms that the Bald Eagles prefer to "hide" in the woods during big storms and windy days. On this snowy day near Homer in Alaska we hardly seen any american bald Eagles in the air at all. Most of the Eagles were sitting close to the forest, only a very few were sitting in the open. It semmed like they were waiting till the snow storm is over. Here is a link to a story about Bird watching Bald Eagles in Brackendale in British Columbia, Canada. 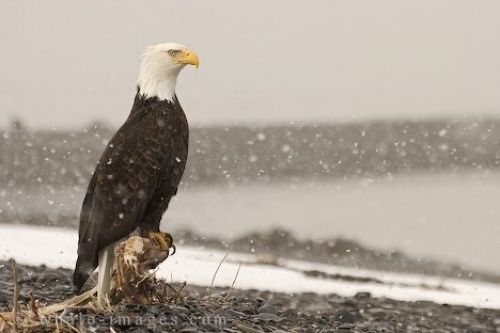 Picture of a american Bald Eagle sitting on a log during a heavy snow storm near Homer in Alaska, USA.